Psst, it's not about the marbling. The Head to Tail philosophy of eating is, thankfully, one of the fastest growing food trends. At this week's MeatCamp(tm) chat, we held an introductory session on how to identify and cook the not-so-fancy cuts of beef, pork, lamb, and chicken, including offal. We were joined by a few formal guests including Larry Liang (@DJPegLeg), an avid home cook and apprentice to Becky Selengut (@ChefReinvented - watch for her upcoming cookbook on sustainable seafood) and The Unknown Chef (@TheUnknownChef) of EastVillageRadio. If you don't know these folks yet, you will. Give them a follow! As usual, participants ran the gamut from Mike Smuckers (@Tweef_32), an artisan butcher in Pennsylvania to those who love offal (@FoodiePrints) and those who don't (too many tripe-haters out there to mention). We had grass-fed and grain-fed beef ranchers, chefs, home cooks, BBQ fanatics, food activists and entrepreneurs, 4-H farmers, restaurateurs, and lots of lurkers. Much of the comments were on beef (no doubt because that's been my main focus to date) but the principles are the same for all meats. You can read the full transcript here. Cuts from the front (Chuck) and back (Round), where the muscles get more exercise, can be a bit tougher than those from the middle, where the well known New York Strip Loin (Kansas City Steak), Filet Mignon, Rib-Eye, and Sirloin steaks are found. Fortunately, there are easy ways to cook meat cuts from the front and back ends. Dutch ovens, crock pots, and learning to braise and stew are simple and easy. 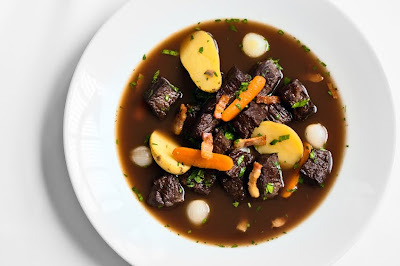 Offal is a real challenge, despite some great efforts by individual chefs and some TV shows. Fortunately, some people love it and there are some ways to cook it to overcome barriers. Asked how we'd make offal more hip led to some great ideas. Please join us every Thursday at 8pm ET on Twitter or use the #MeatCamp hashtag any time. If you have topics you'd like to see covered or would like to be a guest yourself, please contact me or Chris Raines @iTweetMeat. MeatCamp (tm) and #MeatCamp (tm) are trademarks of The Oliver Ranch Company (tm) and The Artisan Beef Institute (tm). Twitter use is an extension of this education and tasting program designed to create an open, friendly forum in which I and Dr. Chris Raines, Extension Meats Specialist and Assistant Professor at Penn State University's Department of Dairy & Animal Science, seek to demystify meat and to celebrate the great artisan farmers, ranchers, truckers, slaughterhouse workers, butchers, chefs and home cooks who help bring it to our plates. Mom's Best Beef Stew "Recipe"
In honor of tonight's #meatcamp chat on Twitter, The Secrets of Finding & Cooking the Not-So-Fancy Cuts, I thought I'd share my mom's beef stew "recipe." The quotes don't mean that the stew isn't fabulous, it is good enough that I've served it to guests as a fancy meal. What they do mean is that there isn't really a set recipe, my mom just made it up one time and recreates it again each time - sorta - with what she has on hand that day. That's right, she just wings it and now, so do I. For the fun of it, I'll just share it as it came to me by email a few years back. The bold italics are my comments. Brown the meat in olive oil 'til brown on all sides. I use an old cast iron Dutch oven type, one with a good fitting lid, but any heavy duty pan/pot will do. Remove to separate plate or bowl. Sauté or braise the vegetables in the pot and then set aside. Add red wine and bring to boil scraping up any browned bits. Put everything back into pan used for browning and sautéing. Serve with noodles, rice or potatoes. The secret to this stew is two-fold: good quality meat and celery leaves. If you don't have wine, use water or stock. Use up tired looking vegetables from your refrigerator. Taste the stew every once in a while and if it doesn't seem right, add a little more whatever! Finally, a money saving tip: Buy a cross-rib or other inexpensive roast and cut it into stew meat cubes yourself. It's easy and you'll likely save a few $ per lb. I am long overdue for a post on an Artisan Chicken Tasting with Heritage Breeds that I helped host along with Mark Trealout of Kawartha Ecological Growers and sponsored by Slow Food Toronto via my Artisan Beef Institute's (tm) sister, Artisan Poultry Institute (tm). Fortunately, there are four great articles written by people who attended the event, I encourage you to read them. Sarah Elton writes "Heirloom Poultry, The Un-Perdue," in The Atlantic. Rebecca Tucker writes "Tastes Like Chicken, But What Kind?" in The National Post. Laura Boyd, one of the Kawartha Ecological Growers, asks "Does All Chicken Taste The Same?" Much has been written of late about a renaissance in butchery. I've seen demonstrations by artisan (and not so artisan) butchers of beef and pork carcasses but friends Dana and Joel of WellPreserved.ca tipped me off about a venison demonstration at Cowbell Restaurant in Toronto, Ontario. 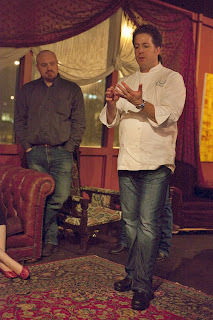 Chef Mark Cutrara was an honored guest at one of my artisan steak tastings and he and I co-hosted a tasting in conjunction City Bites, so I was familiar with his philosophy toward meat. The intimate group on hand this Sunday was in for a bigger treat than learning the art of venison butchery, though: we were introduced to a broader philosophy that Mark and in-house butcher, Ryan Donovan, are introducing to the restaurant scene in Ontario. I am impressed. The demonstration first. Most of us love to complain about the cost of steaks. I've written before that in a 1,150 lb. beef steer or heifer one typically sees only 80 lbs total of Filet Mignon, New York Strip Loin, Rib-Eye, and Sirloin steaks. Did you know there are only a few pounds of tenderloin (filet mignon) steaks in a 90 lb. deer carcass? 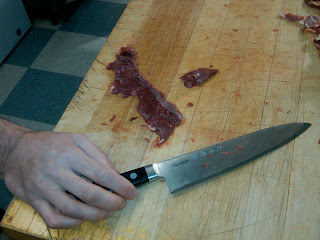 Consider the skirt steak, one of my favorite cuts. The average beef cattle might offer 3 lbs. of skirt steak, total, after aging and trimming. Look at the skirt steak in this deer. Mark spent about 5 minutes trimming this baby, he knows how precious it is. And this is where Cowbell shines. Perhaps one or two people might be lucky enough to savor one of the two tiny skirt steaks that came from this particular pasture-raised and finished New Zealand Red Deer. Can you imagine walking into a nationally recognized steak house and asking for the skirt steak and having them say, I'm sorry, we only had two and they sold out at 6pm tonight? Well, unless you're there at the right time, you will not have the opportunity to savor this week's harvest of venison skirt steaks at Cowbell. For someone who appreciates the focus on head to tail eating but thinks we need to move beyond the feel-good, Mark, Ryan, and team don't stop here but can go on to tell you the exact source of the meat, how it was raised, who slaughtered it how and why, and the way they butcher and why. And herein lies the bigger idea: if we buy, cook, and savor food from different growing regions - whether our own or elsewhere - each item will have it's own signature flavor and texture and will by nature be a scarce resource. One cannot expect to have a filet mignon on demand any more than expecting to catch a sunburn in February. Food has a natural cycle, it will be available as it is available. Depending on the variety, growing region, and husbandry, flavor and texture will also vary. Let us celebrate and savor it as such. Is it Grass-Fed or Grass-Fattened Beef? 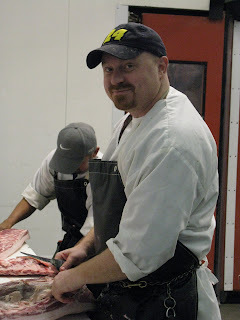 I just got off the phone with a new, exciting discovery, an Artisan Butcher named Bill McCann, from the Fresno, California, area. I hope to introduce you to him in more detail soon but I wanted to share a fabulous distinction that he made regarding grass-fed beef. I'm simplifying this a bit but only because it feels like a great place to plant a seed for a future, in-depth conversation. "There is a difference between grass-fattened beef and grass-fed beef." That's a direct quote, this is paraphrasing: You can get grass-fed beef any time of year. Grass-fattened cattle come from graziers who know how to fatten beef on a grass (and legume) diet, no different than others who have learned to fatten beef on a diet that includes grain. With grass-fattened cattle you typically see white colored fat and you can get more intense flavors. Wine grapes are harvested at their peak and, when wine aficionados find a wine they like, they stock up on it (often getting a discount in turn). Why don't we apply the same concept to beef, pork, lamb, and poultry? Exactly, why don't we? Thank you to Renee and Fredo Martin of Slow Food Madera for providing me the opportunity to meet and learn from Bill. I see a wonderful future for Bill, he can help us demystify and better understand meat, not just beef, so we can find and celebrate the artisan ranchers, truckers, slaughterhouse workers, butchers, and purveyors who today are so very hard to find. I hear every day from people across North America who want to eat better tasting, humanely raised & handled beef but don't know where to start. Here are three simple things that virtually everyone can do. Step #1. Ask your meat cutter or butcher whether he or she carries beef from cattle raised without the use of added hormones or preventative antibiotics. Why? Many will argue against this for ethical and health-related reasons. Here's another: added hormones can lead to tougher beef and in my tasting experience, a blander flavor, too. If they do not, thank them and say, "I wish that you would. Do you know another grocer or butcher who does?" Walk away without buying the beef. Step #2. If the meat cutter says yes, ask them if they can tell you the name of the farm, feed yard, and slaughterhouse the beef is sourced from. If they can do this, write down the answer, give them a hug, try the beef, and let me know who they are! If they can't (99% will not be able to answer this question), say "I wish that you did. Do you know another grocer or butcher who does?" Consider buying the beef and if it's good, let the retailer know but keep asking them to name the source. Step #3. If you come up empty handed after Step #1 and Step #2, repeat the steps once a week and please, send me a note. I will do all I can to find you beef that meets your needs. We are bound to find you great tasting beef from a good source. We may even find an Artisan Beef rancher and butcher within your reach! Are other questions to ask? Yes, in particular about the cattle's breed, diet, and how the beef was aged by the butcher. But if enough of us follow Step #1 and Step #2 on a repeated basis, trust me, retailers will start knowing the answers, you will be eating better beef, and you will be helping the best beef ranchers stay in business and keep their families on the land. ps Can you believe how good those steaks look? Photo is thanks to Jaden Hair of www.steamykitchen.com. And yes, those are some artisan quality steaks! A recent New York Times article on ground beef has led a lot of friends, colleagues, and clients to ask my thoughts on the issue. It's great to see so many of us asking how our food system works but it is complicated territory. 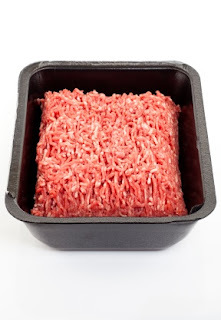 Most of you tell me you were disgusted to learn what goes into commodity ground beef, upset that some companies may have lax food safety standards, and looking for help. I've made it my job to develop a knowledge base on beef so let me attempt to sort through the myriad issues raised in the Times. First, allow me to highlight an issue that is rarely raised. Outside of the sheer yuck factor, one very compelling reason to avoid eating commodity ground beef is that it has very little flavor. Per my earlier post, the reason is that large packers do not use flavor as a primary goal in the first place. Instead, their focus is cost control, to produce the lowest cost burgers that you're still willing to eat. Why spend your hard-earned cash on a lame tasting burger? But anyway, back to the issue at hand. The Times article raises three related but separate issues: the risk of food poisoning from contaminated meat, our inability to trace our meat back to the source, and the inclusion of "trimmings" that have been treated with ammonia. The Bad News: With regard to food poisoning there is no fail-safe solution for any food including ground meat. Meat, vegetables, fruits... at some point all food comes from the earth and typically passes through many hands - including yours - before you eat it. No matter how carefully food is handled, there is a chance that a pathogen may get into your system. The Good News: There is great tasting ground beef out there made from source-specific, quality ingredients and I can help you find it. Now let's debunk a few myths. Buy From Your Local Butcher. I am a huge fan of locally grown and processed meat. However, it's important to know that many meat cutters are buying their beef from the same sources as discussed in the Times. Also, being local doesn't automatically add up to pathogen-free. Buy From A Farmer. Based on hundreds of taste tests I can say with great confidence that you are far more likely to get flavorful ground beef from any farm-specific purveyor whether online or offline. That's because farmers industrious enough to not only raise but also slaughter, process, and market their beef are likely to be preoccupied by flavor and texture, not just yield. Unfortunately, knowing the farmer's name does not ensure pathogen-free meat or a fabulous eating experience. Bacteria can be introduced indirectly such as a deer walking through the field, by renting a neighbor's bull, from a truck or slaughterhouse, or through cross-contamination in your own home. As for flavor, you might be surprised to find out just how different beef can taste from farm to farm. As with winemakers, some farmers and butchers are more talented than others, too. Trust me, you will like beef from some a lot more than others. Grind Your Own. The idea here is to purchase whole muscle cuts such as a Chuck Roast or Brisket and grind it at home or ask a meat cutter to grind it for you. 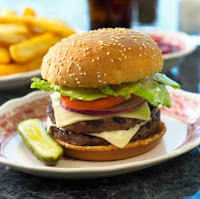 The benefit is you will at least know that there are no ammonia-treated fillers or other oddities in your burger. However, unless you (or your butcher) are extremely scrupulous, you still run the risk of food poisoning unless you thoroughly cook the beef. This is because any bacteria on the surface of the meat, on your hands, in your kitchen, or on the grinder itself can get mixed into the beef during the grinding process. Buy Grass Fed Beef. There are many reasons to choose grass-fed beef (I call it grass-only) including flavor and texture. Eat Wild also suggests some potential health and other benefits, too. 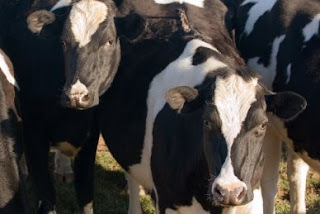 There is some evidence that grass-fed cattle have a lower incidence of certain bacteria but it's important to note that the research is inconclusive. Either way, cross-contamination can occur at virtually any point between farm and fork so grass-fed does not guarantee pathogen-free. Outside of thoroughly cooking your ground beef? Start asking questions! We have a tendency to seek shortcuts and easy answers and sadly many companies are only too happy to comply. No Trans Fats! claims do not make potato chips healthy. All Natural! is virtually meaningless in any food category. But if we all start doing everything we can to know what is on our plates and how it got there - and walk away if the answer is not forthcoming - retailers and processors will eventually start being pickier about how they source their meat. The benefits are numerous. While it will not eliminate pathogens, at minimum buying source-specific meat will increase the chance of having a great tasting burger made without mystery ingredients. To find artisan quality beef I created a list of questions that I employ as a guide. Please feel free to download my cheat sheet here or, if you're feeling shy, I will screen a farm or butcher for you. I also have a list that I will publish soon and expand with time. You Can't Find Artisan Quality, Now What? Artisan beef is extremely hard to find but you can still increase your odds of finding great tasting beef for your family. Look for brand name beef with a label that clearly states the cattle were raised without the use of added hormones or preventative antibiotics. You will likely find that it has more flavor and chances are higher that the ground beef is made from known sources and without ammonia-treated fillers. If you can, order beef from several of these purveyors and compare them in a blind tasting at home. This is a great (and fun) way to find out which flavors you prefer. If you'd like to use my Artisan Beef Institute's tasting guide, which you can download here. A step up is to find a butcher who can at least tell you the name of the farm and slaughterhouse and how he or she aged the beef. (Aging enhances flavor and texture.) Bonus points if they also test their ground beef. These are strong signs that care has gone into the making of those burgers. Have I missed information? Do you have a favorite farm, butcher, or purveyor you'd like to call out? Please leave a comment or send me an email. In the meantime, get out there and vote with your voice and your wallet. Ask questions, good retailers, restaurants, butchers, and farmers are ready and thrilled to respond! I had the honor yesterday to offer a very unique artisan steak tasting at this year's Food Fete New York. Hosted by founder Jeff Davis, Food Fete has to be the best non-trade show trade show in the food industry. The Artisan Beef Institute (tm), which I founded a few years back, offers a series of steak and burger tastings called The Provenance of Beef (tm) (also affectionately known as #MeatCamp (tm)) to help people discover that beef is like wine - flavor, texture, and overall quality vary by farm, breed (grape variety), growing region, diet, husbandry, aging time & technique, and talent! Those at Food Fete were treated to Top Sirloin steaks from four unique farm, slaughter, and butcher teams. While all are reasonably hard to find, I would classify two of these beefs as the equivalent of rare vintages. First up was 100% Grass-Fed & Finished Galloway beef from the Beechy Family Farm in Elroy, Wisconsin. Discovered and offered to meat lovers by Grass Fed Traditions (whose parent company is Tropical Traditions, led by Brian Shilhavy), this beef is from a heritage breed whose heavy coat is well-suited to the growing region. Finished on a diet of native pasture including buffalo grass, switch grass, and bluestem, this beef was dry-aged 7 to 14 days by the team at Edgewood Locker. Using the Artisan Beef Institute's tasting guide, this beef has a fabulous chew, adventurous personality with layers of flavors including notes of baked clams (think umami), and offers a light though lingering impression on the palate. I classify this beef as The Thinking Man's Date for someone seeking an intriguingly flavorful yet approachable grass-finished beef. Next up was a beef that has never been tasted outside of the family who raises it, their close friends, and their butcher, Tracy Smaciarz. Gleason Ranch is an 800-acre ranch managed by siblings Tracey and Ted Baker in the Puget Sound Region of Washington State. Originally homesteaded in 1859, the Bakers are 5th generation ranchers who specialize in raising 100% Grass Fed & Finished Angus & Angus Cross beef. This is another example of outstanding artisan quality grass-fed & finished beef. While I was too busy handing out samples to the wonderful people from O, The Oprah Magazine, Slashfood, New York Daily News, Ladies Home Journal and others to take formal tasting notes, I would classify this beef as Outdoor Adventure Date. Finished on a diet of native white clover, rye, and other grasses grown on the ranch and then dry-aged 26 days, this beef has a texture between like butter and nice chew, a deeply adventurous personality with earthy, rich, loamy vegetal flavors and a long luscious impression. If you like reserved, classic steakhouse steaks this may not be your favorite but if you're like me and like complex yet harmonious flavors, this one's for you. If you'd like to try Gleason Ranch beef, please send me a note at carrie [at] oliverranch [dot] com as a few steaks and burgers will be available in August. If you're in the Pacific Northwest, you may be lucky enough to score a 1/4 or 1/2 that will become available in Fall 2010. The third beef we tasted was brought to us by Meyer Natural Beef and personally presented by the charming Wayne Aiello, who recently completed a launch of the company's online marketplace. 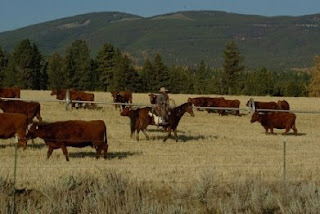 Bob Meyer founded the Meyer Ranch, a 43,000 acre Red-Angus breeding operation in the Blackfoot Valley, Montana, in 1990. The first ranch to be Certified Human Raised & Handled by the Humane Farm Animal Care Program, Meyer now works with over 250 others to offer beef to retailers, restaurateurs, and now directly to consumers. 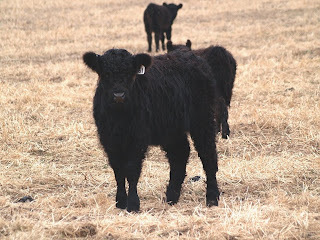 Meyer's Grain-Finished Angus and Angus Cross beef comes from cattle with provable Angus genetics [many rely on the color of the coat to determine breed] and thus offers a more consistent flavor and texture than other programs of its size. I was excited to taste this beef as I'd participated in some of the company's focus groups. I call this beef The Guy (or Gal) Next Door, the handsome/beautiful one you grew up admiring and secretly wanted to kiss. It offers a great chew and straightforward beefy flavor with some lovely roundness especially in the fat and leaves a medium, mouthwatering impression. Last up was one of the beefs in my current home artisan steak tasting kit from The Oliver Ranch Company. This Grain-Finished Holstein-Friesian beef is a consistent crowd pleaser and offers a strikingly different profile than the other three. Raised and finished by Bob Beechinor of 3 Brand Cattle Company in California's Imperial Valley, this beef was wet-aged 21 days. I call this beef Prom Date for its fine grained, like butter texture, elegant, reserved classic beef flavor with hints of baked potato and its short, refreshing impression. You (hopefully) have fond memories of your prom date and would love to see him or her again even after all these years. This beef would pair with just about any sauce but would be overwhelmed by jammy or high tannin wines. Now you're probably wondering which beef "won" the taste test. If you know me, you'll already know that I never pronounce a single winner. The truth is, most tasters told us they enjoyed all four beefs so it was just a matter of degree which one they identified as their favorite. Plus, the tally I kept had all four beefs running neck and neck, something I have seen time and again with my live tastings and home tasting kits. I hope to offer all four of these beefs in future tastings. Please let me know if you'd like to have a tasting in your neighborhood or be qualified by my Institute to host tastings for me! Note: All tasting notes, descriptors, and comments are copyrighted by The Artisan Beef Institute (tm) and The Oliver Ranch Company (tm) and cannot be used without express permission. The images are copyright Jaden Hair of Steamy Kitchen and the respective farms, ranches, or companies listed above. Would Robert Parker Rate A Wine On Appearance Alone? This is how we grade our beef. When farmers participate in my artisan steak and burger tastings, they are like kids in a candy store. Why? Because in the conventional system, farmers are given little feedback on the flavor and texture of their beef. Surprisingly, when the USDA grades beef as Prime or Choice they don't actually taste it. The basis for Prime or Choice is based instead on the perceived amount of marbling (fat speckles) between the 12th & 13th rib bone and the bone structure to estimate the cattle's age. Here's the rub: Marbling actually only accounts for 1/3 of taste & texture. What about the other 2/3rds? Do you love to eat absolutely fabulous beef? Are you a farmer? Do you work in a slaughterhouse or are you a butcher? I am writing a more comprehensive story on what I'm doing to help farmers get the feedback they need and the consumers the opportunity to support those who raise the best tasting, cleanest beef. But I'm looking for feedback here - what would YOU do to help create a feedback loop between farms, slaughterhouses, butchers and those of us who eat the food? What questions, complaints, opportunities do you see? It's one thing to talk about artisan steaks. It's another to understand artisan burgers. If I can give you any advice: Do not buy burger meat from your grocer. They don't actually taste that great! In fact, I'd say they don't taste much at all. Why else would we need to add seasonings to the beef or condiments on top? At first glance, it doesn't make any sense that commodity burger meat is bland. Most is made from older cows or the steaks and roasts found in the front or back end where the muscles get more exercise. Exercise is one contributor to flavor. There are two reasons that most grocery beef is bland. 1. Meat processors and grocers grossly oversimplify what drives taste, texture, and quality in beef. 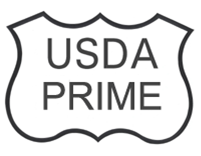 We have been trained to think that USDA Grade (Select, Choice, or Prime) is the key contributor to quality, flavor, and juiciness. This is not true; flavor and texture also vary (a lot) depending on the breed, region, diet, aging techniques, and the relative talent of the grower, slaughterhouse, and butcher. This is as true for burgers as it is for steaks. 2. They are not selecting beef based on how good it’s going to taste in the first place. To grocery stores and meat processors, beef is all about throughput and efficiency. Both industries have high capital costs but with rare exceptions do little to nothing to differentiate themselves vs. their competitors. As a result, they ultimately compete based on price and operate on very thin profit margins. In retail parlance, they literally calculate a "penny profit" - how many pennies do I make on each sale? Wait, you say, this is no different than any business, the idea is to lower the cost of inputs and sell at a profit. To which I would respond, a company or brand that wants to say in business over time will also increase the value of what they are selling. In the case of ground beef, this means at minimum they would go out of their way to purposely offer really great tasting meat. Where does this leave you if you want to enjoy a burger, some tacos, or nice bowl of chili? Find a source of artisan quality artisan burgers! 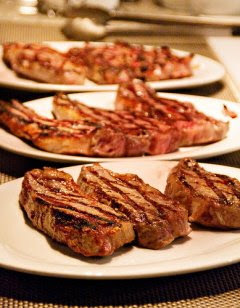 I use the same criteria as with artisan quality steaks, which you can find listed below. If you’re a flavor hound, for burgers I would suggest that you look even harder for a good source of grass fed beef (just make sure you know what you’re getting, some misuse this terminology). When raised and aged properly, you’ll often find it to have a far more adventurous flavor. You will likely have also done a good thing for animal welfare and the environment while you were at it. That’s a win-win-win if I’ve ever heard one! Finally, this post is part of Food Renegade's Fight Back Friday initiative meant to help individuals take control over what is on our plates. Every week I enjoy reading the posts of others who participate in the FBF carnival. I suggest that you take a look, too, and add your own post while you're at it! Specific farm or producer group (source-verified). No added growth hormones (steroids, yuck!). No preventative antibiotics (if they can't keep healthy without 'em...). All vegetable diet, no funky stuff in there like stale chewing gum. Low stress conditions on farm, in truck, at yard (if relevant), & at slaughterhouse. Bonus points: certified organic, humane, grass-only diet, holistic. I'm picky enough about pork that I've by and large stopped eating it. The only pork available in my market is indoor raised, bland, and flabby. It has a grayish color, too, or maybe a sort of dirty white or light dusty pink. In my quest to find the secrets to truly outstanding, clean, humanely raised beef I was perusing the scintillating, fascinating FSIS/USDA Web site and look what I saw in a section called Why is Beef Called a "Red" Meat? "Other 'red' meats are veal, lamb, and pork." Now I've long known that pork is a red meat but imagine my surprise when I discovered that the US government calls it a red meat, too. So why should this matter? Have you heard the marketing slogan "Pork, The Other White Meat"? If the government categorizes pork as a red meat, how does this kind of advertising make it past the National Advertising Review Board? No matter, I love pork. Bacon, chops, hams, I even tried tongue once. But here's something that's important to know: as with beef, the flavor and texture of pork is influenced by the place and conditions in which it was raised and what it ate. 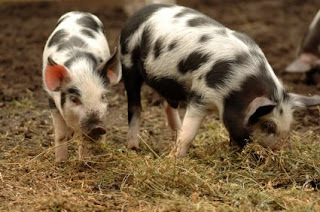 In fact, due to the way a pig's digestive system works, pork is probably even more reflective of "terroir." If you care a lot about taste and texture, I suggest that you look for pork from pigs who've seen the light of day. I am developing a more detailed list of questions to ask but here's a little acid test or mini-cheat sheet, if you will. Ask the butcher or seller the name of the farm. Ask how it was raised. Check to see that it is light red in color. For the first three you'll probably be met with blank stares. If the seller can't tell you these basic things, you can be pretty darn sure he or she is selling you commodity pork. The flavor will have literally been bred out of it. If you do see pork that has a red hue, or lord forbid some marbling, don't think something's wrong with it. In fact, you may be looking at be something that will taste absolutely delicious on your plate. When a tree suffers stress, you can see it in its rings. Whether drought, disease, or fire, times of stress are permanently etched and visible to the naked eye. Have you ever thought to think the same might happen to our food? Stress can permanently, and negatively, influence the taste and texture of our food and in particular, meat. As stress leaves its mark in trees, stress in cattle leaves the meat darker colored, dry, and mushy. Why don't we know this? I think part of the problem is that many, including great people like Michael Pollan, have tried to inspire people to make ethical food choices by focusing on the absence of the negatives. Put another way, we've focused on what's NOT in the beef: no antibiotics, no growth hormones, no corn, no CAFO. Others have focused on the negative impact that industrial agriculture has had on the small family farm or the environment. Finally, much of the conversation around humane treatment has centered on philosophical arguments or man's moral obligation to treat less intelligent, sensient beings with care. A lot of people say they care about humane treatment of livestock but let's be honest, not many act upon it. The BSE scare and a widely aired, brutal video of "downer" cows didn't materially impact the sales of hamburger meat. Is this because we North Americans are so disassociated from the source of our food that we don't connect-the-dots? Or is it just too troubling to remember that meat comes from animals? I don't know the answer to this but what I do know is that when I tell people that low-stress conditions lead to better tasting, more tender and juicy beef, they sit up and pay very close attention. In every single artisan steak tasting I host, the questions from the audience invariably focus on this very topic. I think it is a life-changing moment for many to discover that humane handling isn't just a feel-good thing. Whenever I'm tempted by that supermarket special - Prime Rib Roast, $5.99/lb! - I tell myself, why risk wasting your money and your moral standards, and I do my very best to walk away. If you have friends who want to do the right thing but are still on the fence, do them a favor, let them know too, that low-stress food tastes better. And if you like this post (or even if you don't), may I strongly encourage you to pay a visit to Food Renegade and read other posts, like mine, that are part of Kristen's Fight Back Friday carnival. Let's take control of our food! 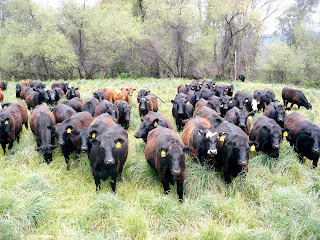 As part of this week's Fight Back Friday carnival, I want to share one of my most popular posts, All Beef Is Grass-Fed. I hope you'll read and enjoy it. As an addendum, I continue to be amazed by how confusing it is for a mere mortal to see beyond label claims, especially when it comes to meat. Government-approved claims such as "natural" or "organic" or "grass-fed" may be well intended but too many mistakenly or purposefully misuse the terms. The "grass-fed" claim continues to perturb me (though "free range" and "cage free" are up there, too). Why? Because all beef cattle eat grass. It's the finishing diet - what is consumed in the last few months - that should ultimately determine whether the beef is "grass-fed" or "grain-fed." Grass-fed should be reserved for cattle raised on grass-only diets. However, I have seen multiple brands, butchers, or grocers mix the two up. To wit, in November I called about 20 Los Angeles area butchers. 10 had never heard of grass-fed beef. The other 10 told me they carried grass-fed beef but after just a few questions, it was clear the beef was grain-fed. One even read to me from the brochure that the cattle "were raised on pristine green grass." But it was Dakota brand beef, which I knew to be grain-finished. The butcher was adamant he was right. I read in turn to him from the Dakota Beef Web site FAQ section. This butcher wasn't being disingenuous. But if he was confused, no wonder the rest of us are, too. Again, here's my original post, All Beef Is Grass-Fed. And take a look at Food Renegade's site to find other great posts on how to take control of our food. Those cattle by the way belong to Mac Magruder from Potter Valley, CA. Mac raises some of the best grass-only beef I've tasted. We've been trained to think that USDA Prime beef is better. So a Prime Chopped Steak or Prime Sirloin Burger - from Morton's no less - sounds like it would be better, too, no? I am not so sure and here's why. USDA Grade measures the % fat in a single muscle and that muscle is not the one making up your burger. USDA Grade is not the only indicator of flavor or texture. Breed, diet, growing region, husbandry standards, and whether and how a butcher has aged the beef will all make a huge difference, too. Let me explain a bit more, noting there are further details on the USDA site and in my head. Point 1. USDA Grade is primarily determined by just two factors. The age of the cattle. Younger cattle (<30 mo.) will generally produce more tender meat. The inspector is trained to review certain skeletal features and the color of the meat to determine the approximate age of the cattle. There are 11 sub-classifications between Standard and Prime grades including 3 in the Prime grade alone (Abundant, Moderately Abundant, Slightly Abundant - here are some images). Further, the % marbling in the rib-eye does not tell you the % marbling in the other sections that are typically used to make ground beef. Point 2. The amount of marbling and age of cattle are not the only keys to flavor and texture, anyways. The USDA grading system does not take into account the breed of the cattle, where it was raised, the diet, or whether and how the beef is aged post slaughter. All of these impact flavor and texture. I have personally tasted burgers (and steaks) made from cattle that acheived only a Select or Standard grade - meaning they had little to no marbling - that were absolutely full of flavor and delicious. The bottom line: The label “Prime” Burger does not tell you how much fat is in your burger nor does it tell you how that burger is going to taste. A lot of us are coming to appreciate the artistry of talented livestock farmers and ranchers. Long part of the mythology of the American West and representative of quiet masculinity, the cowboy is by and large to be admired and emulated where possible. Anyone who knows me knows I have discovered there is a sub-section of meat producers - some cowboys, some not - who are truly artisans of their craft. The Elliott & Ferris families of the Front Range Region of Colorado, who've been perfecting a Charolais beef program for 50 years, are one of my favorites and not just because I love their beef (which I truly do). Tracy Smaciarz is a more recent discovery for me. He is neither a cowboy nor a rancher. Instead, he is an artisan butcher. I'd like to briefly tell you why he's one of my new heroes. First, funny that I met Tracy through a lady named Traca. Traca Savadogo, that is, also known as Seattle Tall Poppy. I was working with Traca, whom I in turn met through Diane & Todd of White On Rice Couple, whom in turn I met through Jaden Hair of Steamy Kitchen, on setting up a series of artisan steak tastings in Seattle under my Artisan Beef Institute's(r) Provenance of Beef Program (tm). "I'm looking for an artisan butcher in the area who I can include on my expert panel at the tastings, " I told Traca in early January. A few weeks later she finds herself at the Chef's Collaborative meeting and sits down at the beef table. The next day, "I didn't have a chance to talk much with him, but Tracy Smaciarz just might be your guy." My is he ever. An extremely personable and affable person, Tracy spent nearly an hour with me on the phone after I cold-called him one day. He may have sized up pretty quickly that I knew a lot about artisan beef but no matter, he certainly treated me as knowledgeable. A second generation meat processor, Tracy, who's about 40, has been "slinging" meat since he was 6 years old. He told me, "I've seen it all. Different breeds on different diets. I've worked in the slaughterhouse, on the truck, I can age, cut, wrap, cure, and smoke. I can tell a dark-cutter [cattle that was stressed at the point of slaughter] by sight and why it tastes as bad as it looks." What is his passion? "I am looking to help my customers sell more directly." Be still my beating heart, this is MY passion. Do you know how to dry-age meat, I ask? Oh, yes, I have my own aging room where I dry-age by the quarter. An engagement was made. Within a few minutes, Tracy agreed to be on my panel and I was thrilled. The marriage came quickly thereafter. "I'm a key member of the Puget Sound Meat Co-Op," a new USDA certified mobile slaughterhouse unit due to come on line this spring. "I'll be certified by the USDA in mid-April and am gearing up to achieve Organic certification, too." Washington state's third such progam, a mobile slaughterhouse can dramatically reduce the stress from which livestock can suffer in transportation and when encountering new places and people at the slaughterhouse. Tracy went on to wow the people who came to my artisan steak tasting events, including Chefs Jason Franey of Canlis Jason Wilson of Crush, food bloggers including Molly of Orangette, and several dozen meat lovers who came to learn more about artisan beef at the sold-out event. I conducted three tastings in a row and with each, I watched Tracy, who claims to have little experience in public speaking, speak with a passion about his work in an ever more intriguing way. He can talk to audiences at all levels of knowledge and make all feel valued and intelligent. Here he is pondering what he'll say after Chef Jason Wilson presents the evening's menu. The photo, taken in Crush's candlelit underground private dining room, is compliments of the very talented Dawn and Eric Wright of Wright Eats. Knowledge. He or she can tell you exactly what is on your plate. The name of the farm(s), the breed or crossbreed, the diet, the husbandry practices of those who handled it, the name of the slaughterhouse. Aging. He will have aged the beef to perfection, using either a wet-aging or dry-aging technique or both. Her eye is trained to know when meat is at its peak for flavor and tenderness. Cutting. She will be an expert at cutting a carcass into final retail-ready portions. In doing so, he will work properly with the grain of the meat and maximize the amount of quality beef from any one carcass. Tracy and I and others will be bringing even more Artisan Beef Institute events this summer to the Seattle and Portland markets. If you'd like to learn more about them and be included on the invitiation lists, please go to my online marketplace and sign up for my newsletter. In the meantime, please join me in congratulating Tracy on receiving his formal approval from the USDA, which came through as expected last week. CONGRATULATIONS, TRACY. Honored to have met you.